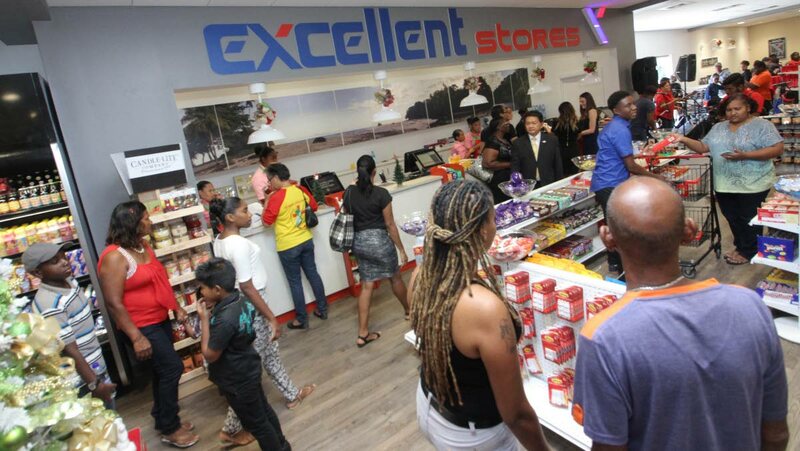 Franco Siu Chong, centre right, looks on as customers experience the grand opening of Excellent Stores’ new location in the Shops of Arima complex, Tumpuna Road, Arima, yesterday. The TT business cycle is in a trough, but managing director of the Excellent Group of Companies, Franco Siu Chong, still believes it is the best time for companies to invest in and expand their operations. “The best time to expand is when (the cycle) is low. Landlords are very accommodating, so once you set yourself now and can survive at the low point you can reap the benefits during the high,” Siu Chong told reporters at the opening of the group’s sixth store at the Shops of Arima, Tumpuna Road, yesterday. This newest location comes exactly one year after the company opened its C3 store in San Fernando. “These plans (for expansion) were set in motion three years ago. We believe in the cycle of business and we understand that there are times when business is low, like now, and when it is good. In the past, Excellent has ridden the challenging times and survived,” he said, adding that the group believed in the resilence of the TT economy. Trade and Industry Minister, Paula Gopee-Scoon said she was “pleased” the group had confidence in the economy and decided to invest. Like Siu Chong, she pointed out that lower lease rates, construction prices and other services meant it was a good time for those who could, to invest. She also implored landlords to be mindful of rents, especially to small and medium sized businesses. Hong Ling Siu Chong, the Excellent family’s matriarch, also attended the opening. She and her husband, the late Siu Joy Chong, first started selling shirts from their factory on Charlotte Street, Port of Spain, in 1947, and 11 years later, opened the first Excellent Trading Company variety store one street over on Henry Street. “My husband and I worked very hard for us to start but thank God I have my son, daughter-in-law (Franco’s wife, Richalene) and grandson (Alex) because without them we wouldn’t have this today. I am very proud,” she said. Gopee-Scoon suggested that the Sui Chongs should return to their roots in manufacturing, since the country could use more manufacturers exporting and earning foreign exchange. She added, though, that as consumers, the country still needed retailers to provide products, such as the home goods sold at Excellent Stores, so the company was filling a need. Reply to "Best time to invest, expand"